If you have ever been to an unlimited hydroplane boat race, chances are you have seen fans of all ages wearing souvenir hydroplane button or two, showing support for their favorite race team and driver. Although handing out souvenir hydroplane buttons to fans seems to be a hydroplane tradition that has lost its popularity with teams and sponsors, there is one fan that is determined to keep the tradition alive. 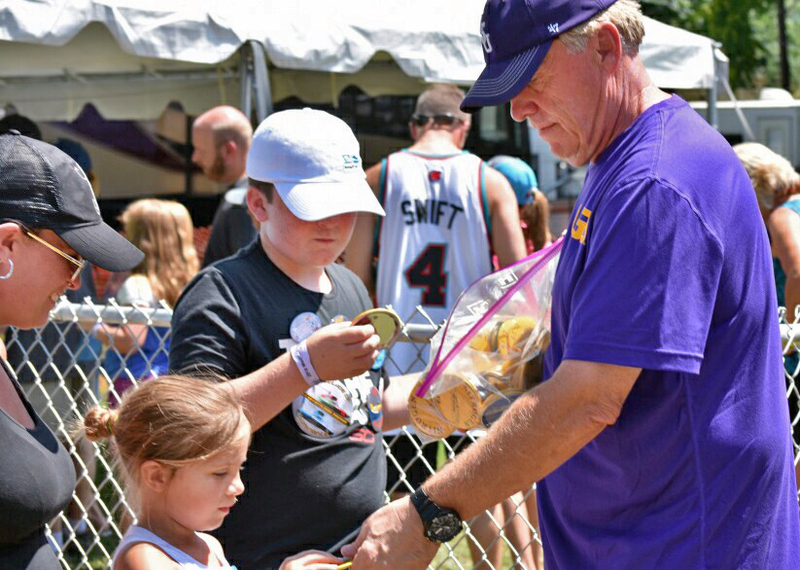 Kerry Sauley, a professor at Louisiana State University figures he passed out approximately 14,000 buttons during the 2018 H1 Unlimited Hydroplane Racing Series Madison (Indiana) Regatta event. “When I was a kid, the teams used to give away buttons,” Sauley said. They flowed like water at the Madison Regatta –the Pay ‘n Paks, the Miss Budweisers, the Atlas Van Lines and the Miss Madisons,” a modestly bashful Sauley said after this year’s Madison Regatta. “It was a magical time and place for a kid like me, he said. He grew up in the small river town of Madison, about halfway between Cincinnati, Ohio and Louisville, Kentucky with a view of the Ohio River and a few blocks from the Regatta’s pit row. In addition to the Regatta, which in 2018 celebrated its 68th year, the City of Madison also owns a hydroplane race team –now sponsored by HomeStreet Bank. As a kid he believed he could design a better button than the teams would pass out. With the help of his mom, he said he came in second in the 1970 Madison Regatta admission badge design contest. He later moved away to attend college and graduate school but always made sure to make an annual pilgrimage back to watch the boat races. Today, he is a wizard of the riverbank. Nicknamed the “Button Man,” this year he made 62 different designs and has designed close to 1,000 different buttons since 2002. “I have made well over 100,000 as the ‘Button Man,’” he said. He pays for the buttons himself, will not take donations to offset the cost, and gives them away free to fans. His strategy for distribution is to give them to the fans waiting in line for the scheduled driver’s autograph session. He also hits the parade route by his childhood home, and a few undisclosed spots. Hydroplane historians say that pre-WWII unlimited hydroplane races used buttons for their pit passes. The first race boat button appeared in 1952. Mobil gas was a fuel sponsor for the race boats. They held a company sales contest and winners won a ride in Stan Sayres’ Slo-Mo-Shun IV. After their ride, each received a button proclaiming they rode with Stan Sayres in the Slo-Mo-Shun IV. From 1956-1959 hydroplane owner William T. Waggoner, Jr. issued souvenir buttons and used the buttons as a way to identify his guests in the pits, keeping other teams away from his pit area and from spying on his propellers and fuel mixtures. In the ‘60s it became almost mandatory that teams make souvenir hydroplane buttons. Team’s would toss them over the pit gates, pass out at community parades and race fans would write letters to racing personalities or boat sponsors, requesting a souvenir hydroplane buttons for their collections. Like Sauley and his brother, Madison resident William Tingle, 15, and his friend Landon Schryer, 7, look forward to hydroplane souvenir buttons every year, and proudly wear their Button Man collections on the front-and-back of their shirts. When Sauley sees their pride in their collections and other fans jubilations, he feels great sense of enjoyment. “In short, I enjoy making buttons and giving them away to fans at the Regatta.